It’s my favorite lesson to plug into the start of the school year. Before I start I want to say that, in the tradition of great teachers and great teaching, I totally stole this and then adapted it to suit my needs. This writing will deal with the idea itself, how and why I have used it, but If you want to know more about the where/when/why it came to be (there is some serious psychological research and principles behind it), I will be putting that out in a separate piece. Here, I am just wrapping up my school year and thinking ahead about what tools I want to sharpen for next year. This one is one I thought I would share. I call it “Signals”, and it’s one of my favorite lesson for a few reasons. To begin with, from the moment learners become familiar with these signals, or cues, they are immensely useful. 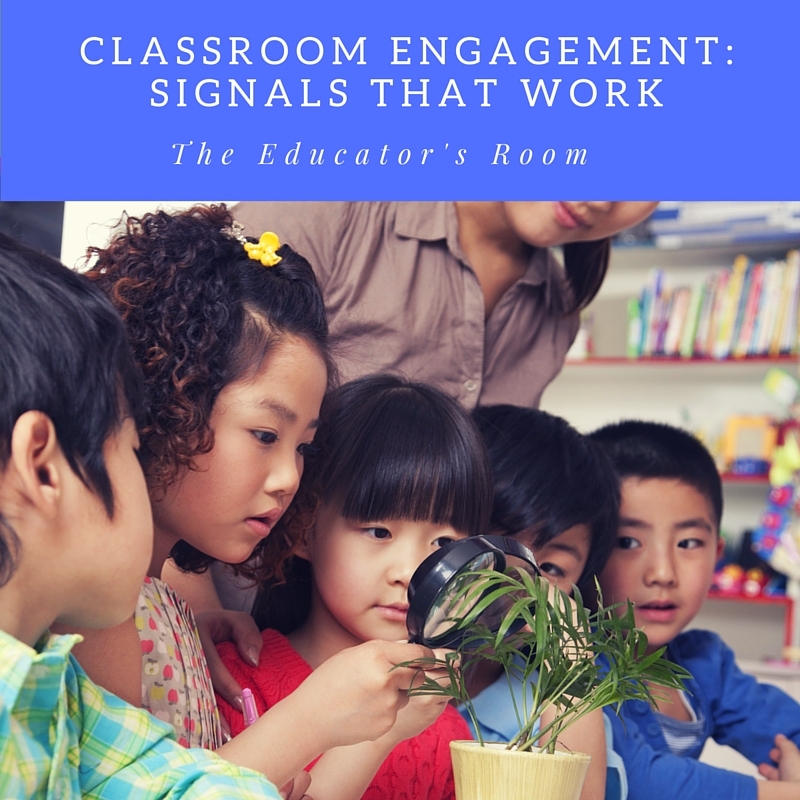 For students, engaging in a lesson through these signals can be socially rewarding because participation becomes less intimidating, and so participation is increased. If, as the instructor, you have even half a personality you can encourage, cajole, and inspire maximum participation and alertness because the procedure hinges on a scripted delivery/choral response method which requires eyes, ears and attention on the teacher. For the teacher, it also eases the process of doing a “spot check” of progress towards learning goals. In a sea of choral responders, it’s easy to hear the outliers or even sense tentative or absent answers (with the choral response- voices in unison). In fact, it won’t take long to learn, recognize and hear specific voices (or not hear them), and respond appropriately to reinforce/repeat until the response is successful. Lastly, in terms of the materials needed: all it really requires is a clear learner-goal, a set of targets you’d like to assess quickly, a hand, and a script of the prompts to be used during the lesson. Now don’t worry about that word script- I am not going to describe a scripted curriculum. This is more like a scripted technique for engaging a whole group, checking on and/or getting needed repetitions with essential facts, and assessing progress. The teacher is not controlled or undermined professionally with a teacher’s manual that either assumes he/she is too new and/or incapable, but instead is empowered to either plug in a super-quick spot check or to design a lesson that is a tool to serve the class as a whole-a way to approach a small chunk of time that ends with precise answers to a specific questions that every student should have down cold. Either a capable new teacher or an experienced veteran could execute or design quick lessons/review sessions around these signals once they had been taught. I usually wait about a one…two…three moment and simply switch that hand to a pointing gesture-almost a conductor signaling the first note pointing gesture. No violent drop or petulant Chris Christie finger-jab, just leading the orchestra that should have its eyes on you, and that orchestra giving you an answer all together. Once the group has it down, you can indicate the desire to hear from a particular group right before you signal integrate a specific group reward system you already employ (star chart, marble jar…) and signal again. Once you get it, have tried it, become comfortable with leading a brief chunk of instructional time this way- you may find that you break these signals out in unplanned moments of need. Copiers broke down, class is a little crazy, you’re a substitute in a class that needs some additional controlling factor beyond their own internal exemplary behavior standards…the technique is definitely a multi-tool. Once you and your learners have it down, nine to fifteen signal-response items are typical depending on the type of content you are covering (zipping through math facts review- quicker, correctly identifying components of a sentence- maybe slower. I will give examples for both in a bit). I was interviewed for a teaching position once, years ago. I already had a teaching job and my own classroom, had been teaching for a couple of years, but baby number one had come (17 now- going in to her senior year) and my wife and I (20 years this year) were then at that “early big decisions” place in our lives. In our first, tiny little in-town home and knowing we were going to want a little more space, a more rural setting, maybe a home in between her family (a little over an hour away) and mine, a different smaller school for our children. So I was putting out the feelers, and I got this bite. Going into this interview, I knew that I was going to be asked to teach a 10 to 15 minute lesson with a small group of about 6 or 8 elementary aged students who were attending a summer school program. For many, demonstration lesson interviews make them nervous. Me? I had no lesson plan, and I didn’t sweat it. I did type up a one paragraph description of the signals and the use that would be demonstrated: “student engagement”. Experienced teachers have seen plenty of student teachers, new teachers, substitute teachers and even other more experienced ones who will frustrate themselves trying in vain to engage their students. There are times when it is a challenge for me too, don’t get me wrong. For whatever reason, a lot of time is wasted trying to get students to attend, and even in a classroom that appears quiet and controlled-students may not be as engaged with content as they could be. So it would have been a rookie mistake for me to pour over some supposed gem of a lesson attempting to reach an epiphany outcome for the students in that short amount of time, only to find myself frustrated and awkward when my dreams were shattered in front of an audience of peers watching me closely-mentally assessing my every move. I was never one for feeling stressed, life is too short. But why even risk it? I went with no lesson plan other than to teach the signals. When I had finished, I was brought to meet the superintendent who told me that if his teachers were bringing me right over, that they must have liked what they saw. Once the talking part of the interview was completed I was told that we would be beginning the demonstration part, where the interview team would observe as I led a short lesson. We had been in the room where the students and the adult working with them were, so I had the opportunity to gauge their ages before I began. Based on what I saw I decided that I would integrate a days-of-the-week based prompts to facilitate learning the signals. To risk something like math facts, as easy as I might think it would be, could present the danger of me having to then cover content if it wasn’t already learned as opposed to using known content to teach the signals. The signals are a unifying and progress assessment tool, and the instructional principles behind then rely on adherence to a reinforce mostly, introduce new learning gradually approach-at about an 85% to 15% ratio. In other words, spend 85% of your time checking on an solidifying previous laid foundation, spend 15% building your tower of knowledge higher. ME: Raise your hand if Have you ever been in class, had the teacher ask a question that you know the answer to, and then someone else shouts it out before the teacher calls on anyone? (All hands go up) Everyone, right? Happens all the time. Sometimes you know it right away, other times you just need an extra couple of seconds to get the answer ready, but then someone just says it while you wait with your hand in the air or before you’re done thinking. Or maybe the teacher surprises you and just calls on you…and you weren’t ready and then you feel embarrassed. Wouldn’t it nice to have the time to get your answer ready, and if everyone waited just a couple seconds to get an answer ready? Or maybe you’re just shy, you know, you just aren’t comfortable talking in front of everyone. Well I’m going to show you a tool that can help. It gives everyone the chance to answer and it gives everyone the time they need to answer. It’s easy for anyone to use it, and it doesn’t cost anything. Are you interested? It’s this (point to my “wait” hand with the other free hand). When this signal is showing everybody waits-not very long at all, like a “1…2…3” count, and then the next signal comes. That one looks like this (drop the “say it” signal). So today is Wednesday, right? If I ask “What day is today?” and my hand is like this (wait), you don’t say it until I go like this (say it). Let’s practice. ME: Wow! That was pretty good for the first time, but I want to try it again to get us all coming in at exactly the same time, okay? I’ll ask the exact same question, it will be the same answer, we’ll just see if we can get the timing down tight. I repeat, with enthusiasm, they respond with enthusiasm, it is together, they are smiling…it was a beautiful moment and makes what comes next easy. ME: Yes! That’s better than any group I’ve seen on the first day…so now I want try out a couple of things to see how smart you really are. Are you ready? The students say yes, are enthusiastic. I repeat in similar fashion, using the word “yesterday”, then kick the thinking up a notch with things like “What day will it be two days from today?” and “What is the day before Sunday?” At this point I am making up the questions as I go along because my purpose is engagement and teaching the signals. Within those minutes I easily had the group’s attention. I’m not saying that because I’m so awesome, I’m saying it because the tool is so useful. So yeah, it was so cool, and it was so easy, and I probably could have had that job…but what about real life and the classroom… if it is yours? If you are power point adept, and have the means to display presentations, you can integrate a more visual component that displays (fade-in, sparkle-in…etc) correct response answers to reinforce acquisition of facts, and keep their attention. The tie that Mr. McConnell wore is funky. By now, you get the picture. Again, this isn’t really a tool for teaching new content, but is great for spot checking, reinforcing, warming up, and finding out where gaps might be in order to fill them before moving on. Soon I will follow up on this with more information about why I love this technique.